Wednesday, September 26 marked the first day of autumn quarter, and the start of the 2018-19 academic year. We are excited to welcome 24 campus students and 22 online students to the MS program. 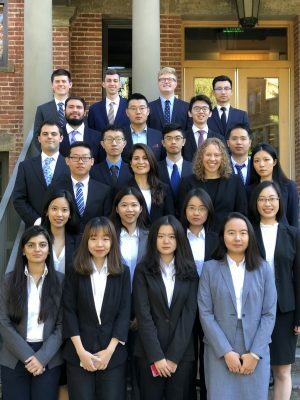 The 2018 CFRM MS campus cohort on the steps of Lewis Hall. The 2018 campus cohort includes students from four countries, and nearly half (46%) are women. Students earned their prior degrees from four countries [China, Colombia, U.K., U.S.], and come from 14 different states. In addition to new students, we are welcoming new instructor Patricia Ning, who is joining the program after completing postdoctoral research in the Department of Statistics and Applied Probability at University of California Santa Barbara. Patricia’s research interests include probability, financial math, stochastic control, statistical inference, machine learning, and data mining. She earned her PhD from UCSB under the supervision of Distinguished Professor Jean-Pierre Fouque. Patricia will be teaching CFRM 504, CFRM 505, and CFRM 550 this academic year. Next PostWhat Can the CFRM Program Do for You?